A picture is worth a thousand words . . . and, in the case of real estate listing photos, they may be worth even more than that! Your listing photos are the first thing that potential buyers see when it comes to searching for their dream home. In fact, a recent survey found that 86% of home seekers find photos to be the most useful feature online when it comes to real estate. What’s more, 84% of buyers and sellers said they would not consider buying a photo-less listing. Stellar photos can hook a buyer and may make for a lucrative close for your clients. But photos that make a buyer want to jump at the chance to see the property aren’t just about how you take the photo, it’s about what features in the home you choose to showcase! Ensure that you make your listings stand out by including these 5 great shots that buyers can’t resist! 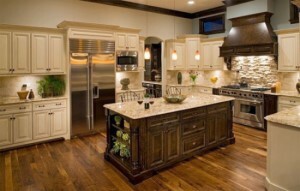 Nothing kills the buyer love faster than a cluttered, crazed kitchen. The kitchen is the heart of the home, and for many buyers it’s the difference between saying, “I gotta have it!” and “Next, please!”Before scheduling your listing photo appointment, get your seller’s to help you uncover their home’s incredible potential! An Extraordinary Exterior Keeps ‘Em Coming Back! A great collection of listing photos depends on having a great mix of interior and exterior shots. If you listing photos only feature the interior of the home, buyers may be left wondering, “What’s wrong with the outside? !” Remember that your shots should reflect the current season. If it’s spring, who wants to see a snow-covered home? The average person sleeps a whopping 25 years in their lifetime. It’s no wonder that one of the must-have listing photos to capture motivated buyers is the master bedroom. The key to taking a great master bedroom shot is to really highlight the room’s dimensions. You want buyers to see the space as spacious, but cozy. Take your pictures from the corner of the room to show of the size. Highlight great windows, pretty built-ins or special details like crown molding. And–as always–clear away any clutter on dressers or nightstands. Bathrooms are one spot where simple renovations can make for a big return on investment when it comes to selling a home, but even if your clients want to work with that they’ve got, you can still make the space look like a luxury spa. Pay attention to small details. Here are a few bathroom photo recommendations from street savvy agents like you. Close the toilet lid, Accent with fresh towels, Clean before you shoot. There’s a difference between showing a space and showing-off a space. In the spirit of the latter, the main thing that will take your living room shots from sufficient to offer-inspiring is your staging. The living room is perhaps the space where staging can really pay off. When choosing your staging ammo, make sure you target your ideal buyer with the accessories and furniture. If the property would make a first time home for a bachelor, you might want to stay away from big floral couches. On the other side, if your home is great for a growing family, make sure you show off important family features like storage. Cut the clutter – One thing that is a universal buyer turn-off is unnecessary clutter! Go back to your home and design magazines and point out how the most drool-worth kitchens lack clutter and appliances on the counters. You can also snag easy, inexpensive staging ideas! A gorgeous bowl of fresh lemons placed in the center of a island brings a bright pop and an inviting air into a kitchen. Highlight high-end items – When it comes time to capture the shot, make sure you capture close ups or shots that highlight interesting features like custom back splashes, high-end appliances, and other details.